Coyote Meadows visitors will enjoy views of Downtown and the Santa Cruz Mountains. Coyote Creek meanders along the western edge of Coyote Meadows. The meadows of "Coyote Meadows" are at the base of a bluff that is the cap of a former public landfill. Before that, the site was a clay quarry for making bricks. The historic Western Pacific Railroad trestle crosses Coyote Creek and will become part of the future Five Wounds Trail. Coyote Meadows skirts Little Saigon on Story Road and will have beautiful views of Mount Hamilton and the East Foothills. The Coyote Meadows Coalition joins groups and individuals focused on opening up and activating for parkland a 50-acre city-owned parcel along Coyote Creek between Story Road and Hwy 280. The Coyote Creek Trail runs along the western edge of the area while the future Five Wounds Trail will run along its eastern edge. The land is already designated as parkland. Our goal is to open up the area to passive recreational uses as well as to improve the water quality of Coyote Creek by reducing homeless encampments in the area. ​Opening up ​Coyote Meadows for park uses would provide access from the Spartan-Keyes Neighborhood and from Kelley Park and Happy Hollow, as well as from Little Saigon along Story Road to the east and from the Olinder Neighborhood and other nearby neighborhoods to the north. A historic train trestle is the gateway to Coyote Meadows from the south. The park will be a critical segment of the Bay Area Ridge Trail and will be the hub for the Coyote Creek Trail and the future Five Wounds and Three Creeks Trails. It will provide exercise and green commuting opportunities with connections to public transportation like BART and BRT. Coyote Meadows will offer elevated panoramic views of Downtown and Santa Clara Valley. It will include shady lowland trails along a riparian habitat and a unique expanse beneath a freeway for pop-up cultural events. The multi-level landscape of the park will offer recreational and fitness opportunities like BMX biking and stair-climbing not available elsewhere in the area. Visitors to Coyote Meadows will learn about the natural diversity of the flora and fauna of our valley through partnerships with outdoor education foundations and signed nature trails and murals. Displays will bring to life San José’s radio broadcasting, railroad, and brick making histories and will connect to the nearby, nationally-registered Ashworth-Remillard House. Linking Coyote Meadows to Kelley and Selma Olinder Parks is a major step to creating one continuous grand park for our city. Coyote Meadows Redevelopment Concept Plan Released! In the spring of 2016, we began to plan and advocate for the activation of Coyote Meadows. With funding from the Santa Clara Valley Open Space Authority in December 2016, we launched a community planning process in the Fall of 2016 to gather community goals and open space concepts to inform future use decisions by the City of San José. The concept plan summarizes the outcome of this process, including site analysis, the community outreach process, community vision and goals, identification of site challenges and constraints through engagement of a Technical Advisory Committee, related planning initiatives, stewardship options and implementation considerations. View the Coyote Meadows Redevelopment Concept Plan. This project was funded in part by the Measure Q Urban Open Space Grant Program of the Santa Clara Valley Open Space Authority. 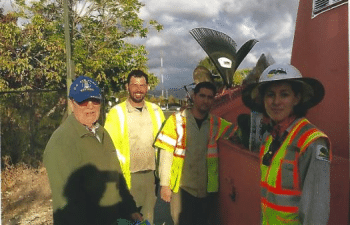 Adam Matsui, Patti Workover and Jason Castro cleared some of the weeds along the Story Road sidewalk at the southern edge of Coyote Meadows and Patrick Pizzo helped the team rake a few spots where poppy seeds were spread. 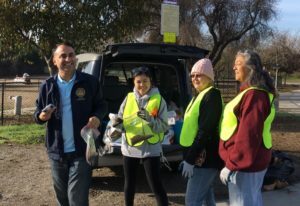 In early 2018, Assemblymember Ash Kalra helped neighbors broadcast more seeds.